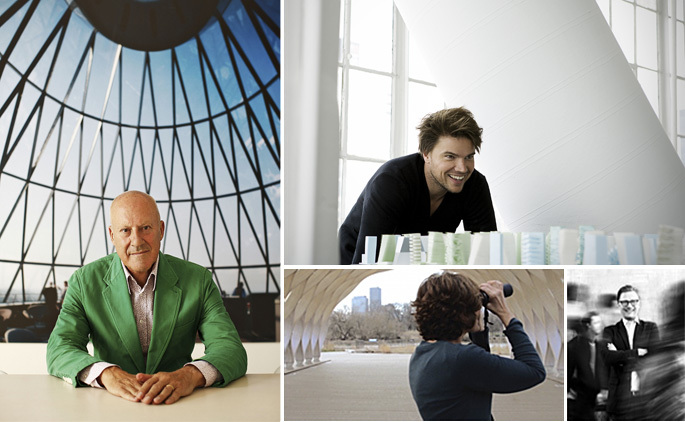 Want to get some one-on-one time with the world’s most prolific architects? Well here’s your chance to pick the brains of the world’s leading creatives—and go on an adventure while you’re at it! The Van Alen Institute‘s annual Auction of Art + Design Experiences is in full swing and they’ve got some great outings for you to lift your paddle for. A ride in Norman Foster’s private helicopter, birdwatching with Jeanne Gang, and a private tour of Bjarke Ingels’s ski mountain/smoke-ring blowing power plant are just some of amazing excursions being offered—although there are far more relaxed options as well. For lovers of leisure: How does soaking in a hot tub with Charles Renfro of Diller Scofidio + Renfro, cocktails and three of your best buds sound? Hot Tub Roundtable: Spend a summer Sunday at Charles Renfro’s house, featuring a roundatble discussion in his hot tub—the place where Renfro has his best ideas. Starting bid $1,950. Smoke Up with Bjarke Ingels: You’ll get to accompany BIG’s founding partner Bjarke Ingels and partner Jakob Lange as they test their self-built smoke ring generator for their new waste-to-energy power plant at the Amager Resource Center in Copenhagen. Starting bid $1,950. Eye in the Sky: Go on an urban birdwatching expedition in New York’s Central Park or one of Chicago’s lakefront parks with architect Jeanne Gang. Yes, this lady knows buildings and birds. Current bid $950. Helicopter Flight over London: Norman Foster is lending out his personal helicopter for an aerial tour of London. Expect to see all of his buildings pointed out. Current bid $1,450. Discover the Disappearing Mississippi River Delta by Plane: Trey Trahan of Trahan Architects will take you on an incredible expedition of the Mississippi Delta by private plane. Learn about the river’s morphology and how it’s dictated the built environment. Current bid $1,150. A Dutch Designer’s Secret Garden: Landscape designer Piet Oudolf (he’s worked on the High Line) invites you to join him on a tour of his private gardens in Hummelo, Netherlands, and to grab a drink at his favorite hangout, a 400-year-old bar called Gouden Karper. Current bid $950. Everything is priced accordingly (i.e. by starchitect cred) but there are a few items going for as little as $500. However, you should know that you will have to provide your own flight and accommodations if you win. You can place your bids and see all of the other prizes being auctioned off here. The auction closes on May 20th.